The "games in development" program also includes DRM-free downloads and rollbacks to previous versions. GOG.com is joining rival Steam in selling early access to unfinished games, but with a more cautious approach. As with all GOG offerings, the big difference compared to Steam is the absence of digital rights management. The games will also support GOG’s optional Galaxy launcher client, which lets players turn off auto-updates and roll back to previous versions. This should be especially useful for early access games, whose stability and features are always changing. 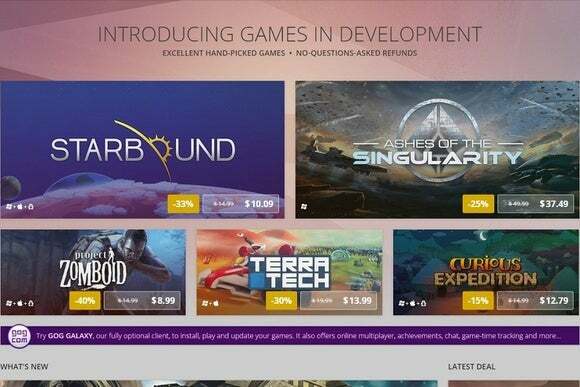 Still, GOG is taking one idea from Steam for its games in development program: All purchases will come with a 14-day, no questions asked refund window. Valve currently offers these types of refunds for all Steam games, not just Early Access releases. Why this matters: The early access model has been both a blessing and a curse for PC gaming. While it has given birth to shining gems like Kerbal Space Program and Wasteland 2, there’s no guarantee that the games will match the developer’s original vision or even reach a finished state. Valve has certainly acknowledged these issues on Steam—at times telling Early Access developers to ratchet down the hype—but still takes a fairly liberal approach with nearly 700 games on offer. It’ll be interesting to see how conservative GOG is by comparison as its own program gets underway.